Like many others, I imagine, my first consistent exposure to horror was through the films of Hammer. Growing up in the UK you could rest assured that these pups would make frequent appearances on television, especially on a Friday evening. The seeds were sown, and Christopher Lee was the villain extraordinaire; Hammer will always hold a spot close to my heart. So, it’s always a thrill to see the new Blu-ray/DVD combo releases from Synapse drop into the mail box. Although I missed the last release, Hands of the Ripper, both Vampire Circus and especially Twins of Evils were terrific releases. Twins was beautiful and a thoroughly entertaining movie. Vampire Circus was just downright weird, yet still a blast. Both, however, were given wonderful treatment by Synapse. 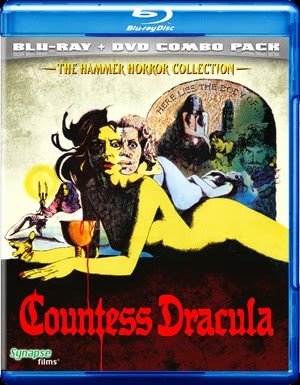 The good news, with Countess Dracula, is that once again Hammer has been afforded wonderful treatment on this new Blu-ray/DVD combo. The artwork is a love it or hate it affair, although the sleeve is reversible, so you’re bound to dig one of them, and there’s some delightful extras attached, for your increased viewing pleasure. And then there is the film itself. As a film, this has most of, if not all, the Hammer staples. You’ve got plenty of cleavage, Ingrid Pitt as the Countess is gorgeous, a fair smattering of blood (although it is quite tame by Hammer’s standards) and even one of the townsfolk that looks remarkably like Stanley Kubrick. However, for my personal tastes it is one of Hammer’s less notable movies; it just didn’t work as well as some others. This is not to say it’s not a good film, or that it is not entertaining, I just prefer other films from the studio. Will you want it in your collection? Hell yes you will; it is still classic Hammer and there will be many that will lap it up. It just wasn’t a personal favorite for me; I prefer my Dracula’s to have fangs and to turn into bats now and again. Countess Dracula owes far more to Countess Bathory than it does to Sir Christopher Lee’s iconic Count. As a release though, which I briefly mentioned earlier, it is a beauty. Aside from the packaging and extras, that are included, the film also looks beautiful; with a nice freshness to it that breathes new life into this classic of UK horror. Whilst it may not have floated my proverbial boat, as a movie, it is still a wonderful release that should not be overlooked. Personal tastes differ from person to person and I may well be in the minority here, as I don’t think it is Hammer’s best. However, Synapse plus Hammer plus Blu-ray (and Ingrid Pitt) generally speaking adds up to being a winner, and that’s no exception here in terms of the quality of the release. I already asked if you’ll want this in your collection, now I’ll ask if you should add it to your collection. The answer to both is definitely yes. Countess Dracula is released on Blu-ray/DVD combo pack from Synapse Films.